Thanks to Dr. Sergio Sarita, Chair, Department of Pathology, Oncology Institute, Dominican Republic, for contributing this case. To contribute a Case of the Week, follow the guidelines on our Case of the Week page. Don�t miss an issue of the basic pathology research journal covering all biomedical disciplines in the broad spectrum of pathology. (2) The Transfusion Medicine chapter has been updated based on a review by Huy Phu Pham, M.D., Columbia University Medicial Center and the New York-Presbyterian Hospital. (3) We have now combined the two sections of the Stains chapter to make it easier for you. We will start updating the topics more frequently. Let us know if there are particular topics you are interested in. (4) Our Feature Page for November 2011 highlights Consumable Lab Products / Clinical Lab Analyzers, and includes Biogenex, Leica Microsystems, Sakura Finetek USA and Ventana Medical. A 25 year old single woman with a history of "asthma" since childhood was found dead in her apartment. The autopsy revealed a 6x5x5 cm gray-pink hard mass at the cardiac apex in the right ventricle. No other relevant findings were observed. Toxicologic studies were negative. 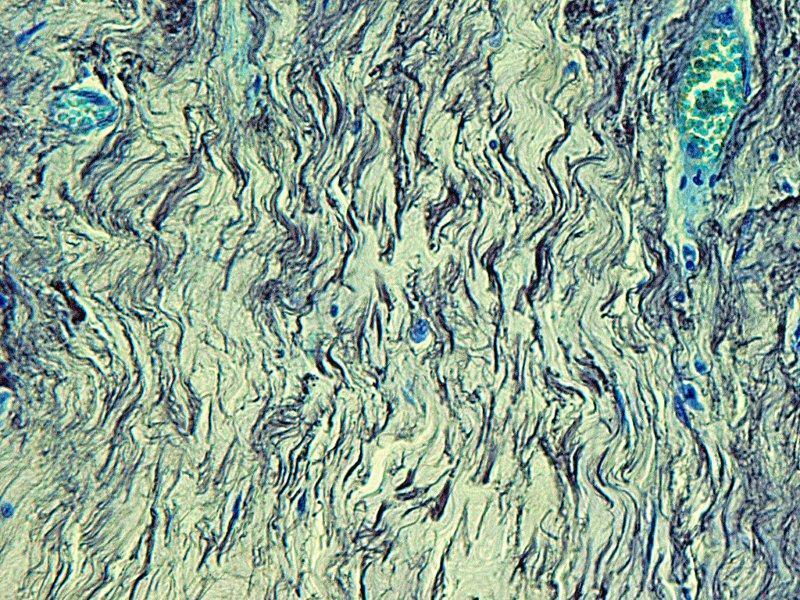 Microscopy showed a hypocellular fibrocollagenous tumor with abundant elastic fibers visible with the elastin stain. 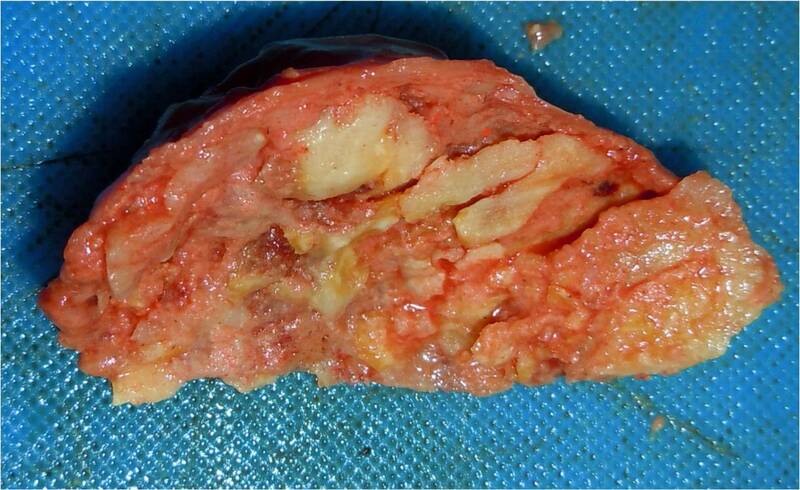 Cardiac fibroma is a rare tumor of adults that typically presents with heart failure, arrhythmia, cyanosis, chest pain or sudden death (J Thorac Cardiovasc Surg 1994;108:862). Some patients have no symptoms, and 10% have Gorlin�s syndrome (nevoid-basal cell carcinoma syndrome). 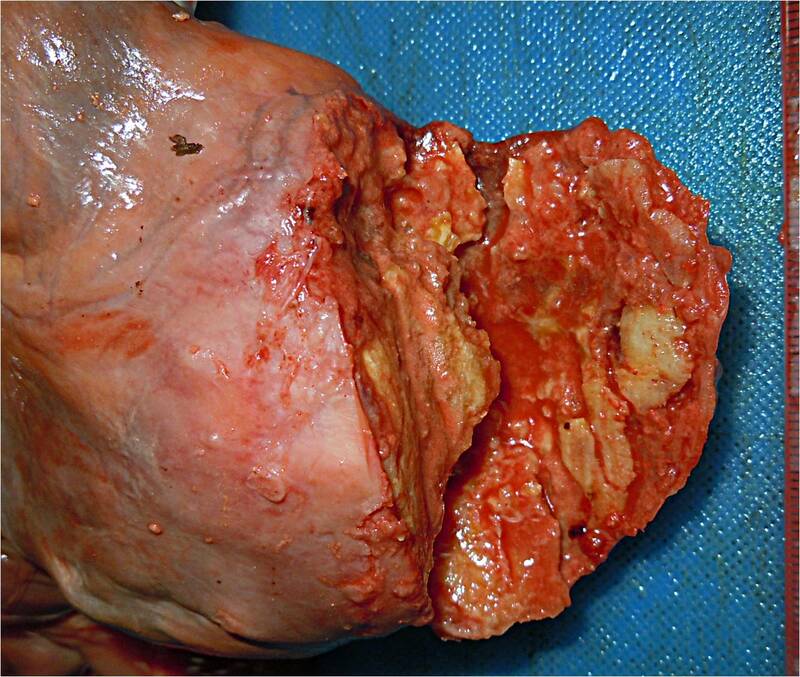 In children, cardiac fibroma is the second most common benign cardiac tumor, after rhabdomyoma, but still uncommon. 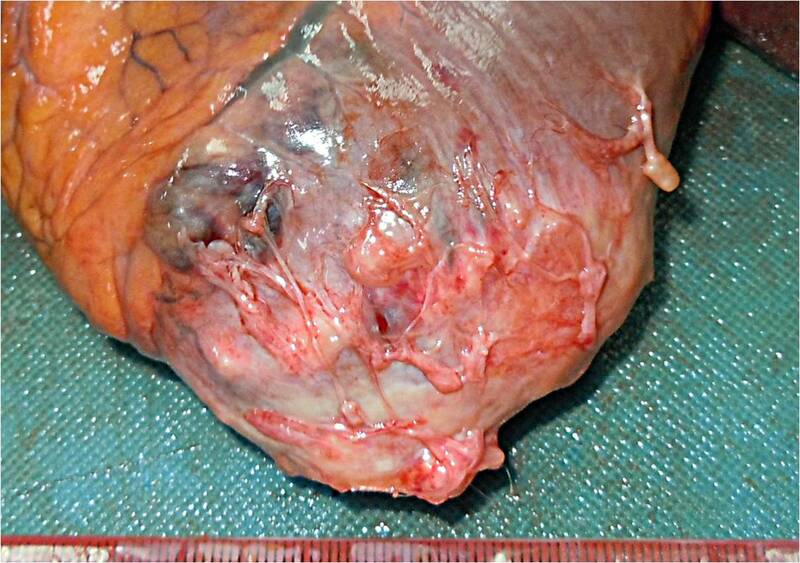 Grossly, the tumor is a discrete bulging mass, nearly always solitary. 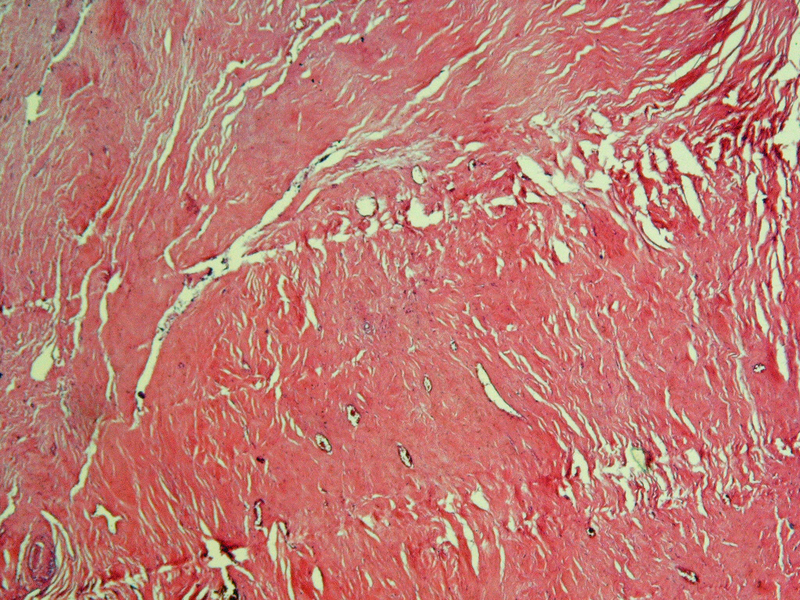 It is composed of bland fibroblasts and collagen, often with calcification, with an infiltrative margin. Tumors are more cellular in infants and children, and mitotic figures are identified only in infants. Occasional features are perivascular lymphocytes and histiocytes, elastic fibers (as in this case) and myxoid stroma. • Inflammatory myofibroblastic tumor / pseudotumor: spindle cells larger than fibroblasts with obvious nucleoli, inflammatory cells, prominent vasculature, variable myxoid stroma; occasional mitotic figures and necrosis (Ann Diagn Pathol 2001;5:335). • Benign fibrous histiocytoma: extremely rare in heart, storiform pattern of spindle cells and lipid laden histiocytes. • Scar: grossly does not bulge. Many sporadic cases of cardiac fibroma may be due to mutations of the PTCH1 gene, localized to 9q22.3, which is also the underlying cause of Gorlin syndrome (Cardiovasc Pathol 2008;17:93). 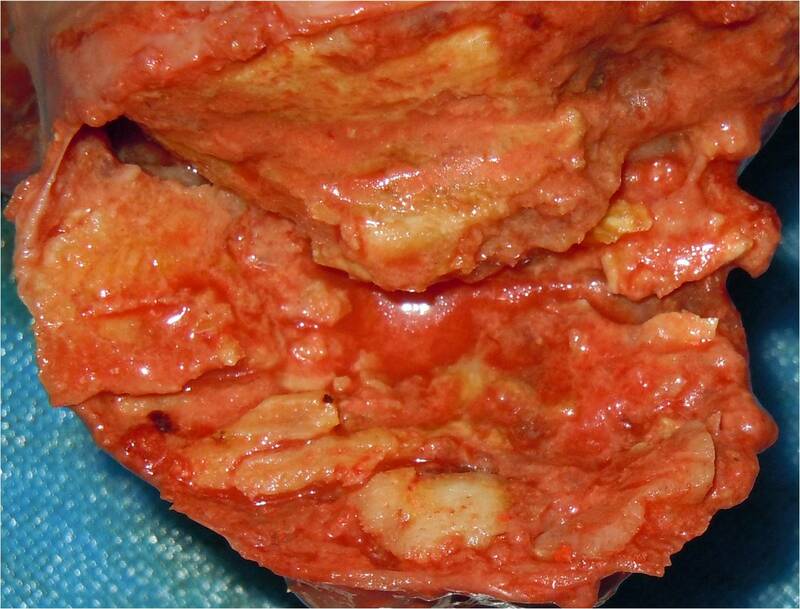 Surgical treatment of cardiac fibroma is generally successful, although transplantation may be necessary. Additional references: Heart-Tumor chapter of PathologyOutines.com.